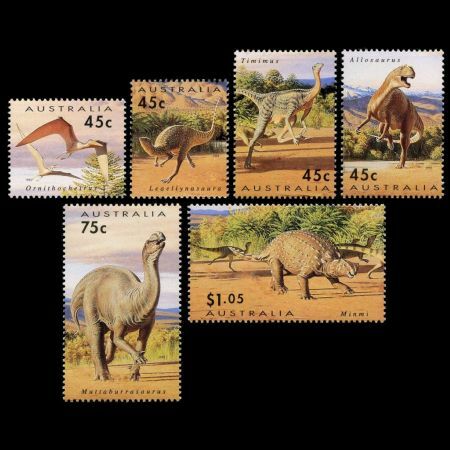 Turning back the clock to the late 1800s, the first Australian dinosaurs were discovered but remained extremely rare among Australian fossils. 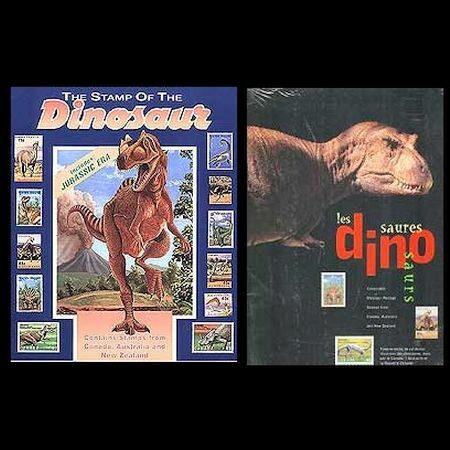 Between the time 1932 and 1981 no new dinosaur research was carried out, though in recent years some exciting discoveries have been made. 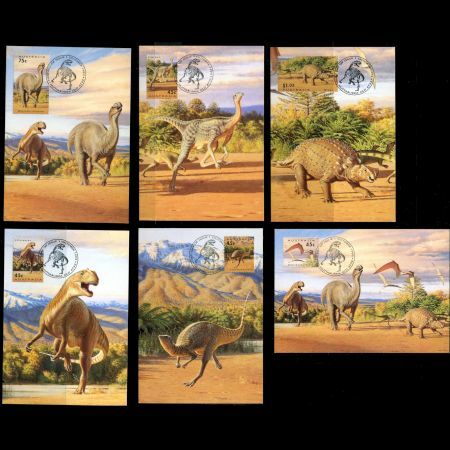 Dinosaurs dominated Earth for more than 160 milion years. 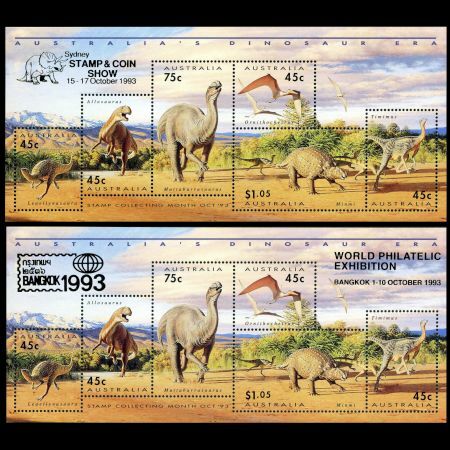 The stamps in the mini-sheet show a scene from the early Cretaceous period in Australia (more than 100 million years ago). 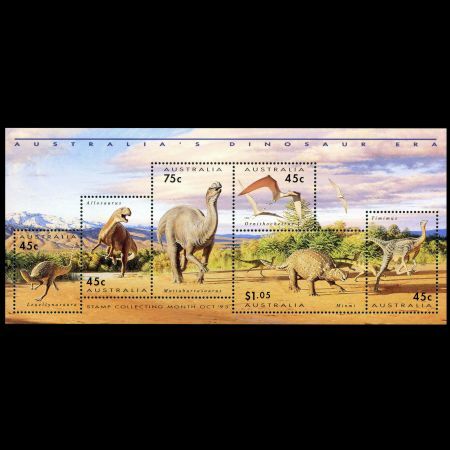 Two of these stamps are issued as self adhesive too. 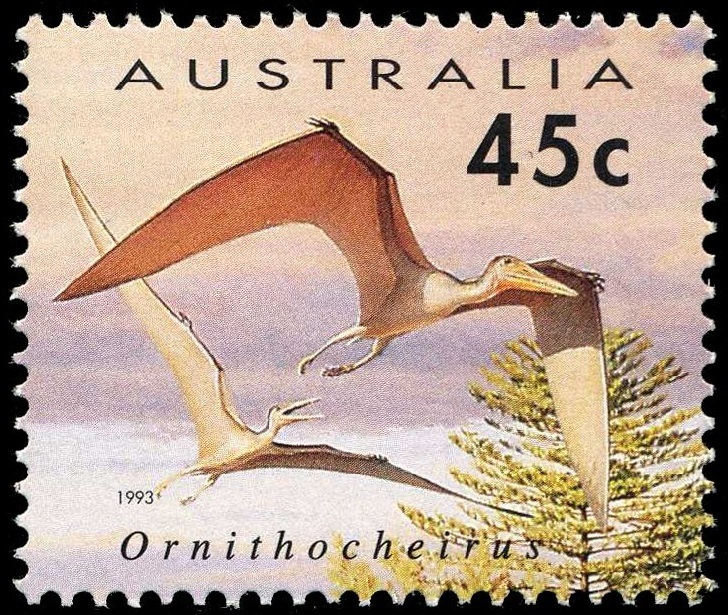 Flying reptiles or pterosaurs were not dinosaurs. However, they lived at the same time and were warm-bloodedthe energy demands of flight could never be met with a cold-blooded metabolism. 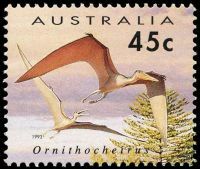 Ornithocheirus lived in the Late Cretaceous and is also found in Europe, South America and Africa. 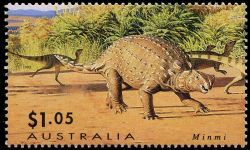 First found in Australia in 1979, near Boulia in south-western Queensland. It was a coastal species, and had a wing span of about 2.5 metres. 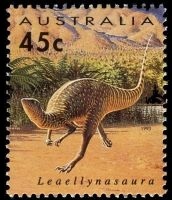 About the size of a chicken with a skull only 6 centimetres long, Leaellynasaura was a bipedal herbivorous dinosaur. Its eyes were exceptionally large, as was the part of the brain dedicated to processing visual signals (the optic lobes). It would appear to have been adapted for life in semi-darkness. 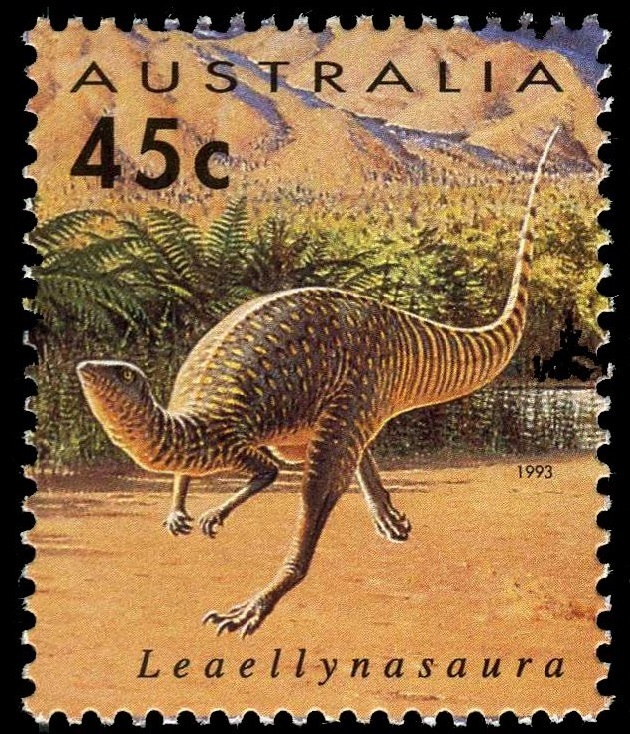 During much of the Cretaceous, when Leaellynasaura lived, Australia was far closer to the South Pole than it is now, and would have been almost continuously dark for two or three months of each year. 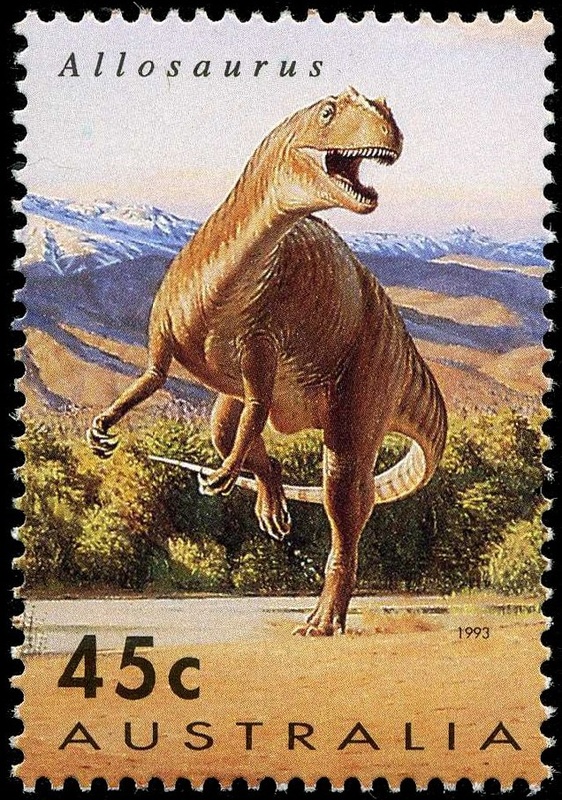 It has been suggested that this little dinosaur, too small to migrate,remained active throughout the long winter. 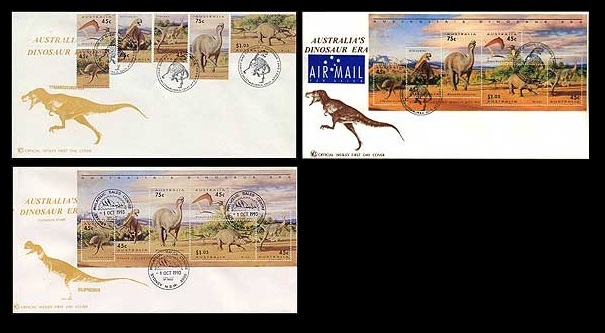 Allosaurus was the big predator of the North American Late Jurassic, 135 million years ago, so it is a surprise to find it in Australia some 10 to 20 million years later. It grew to 12 metres long, and weighed up to two tonnes. 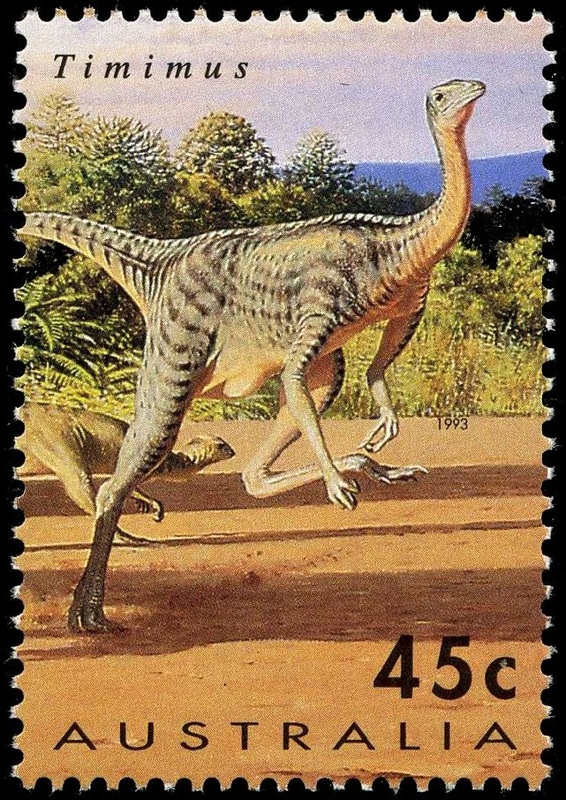 This ornithomimosaur (ostrich mimic dinosaur) is known from two thigh bones discovered in 1992. 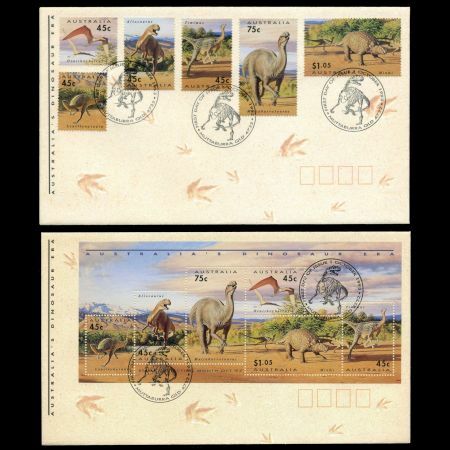 It probably looked something like a big emu, but with strong arms and a long, stiff tail. 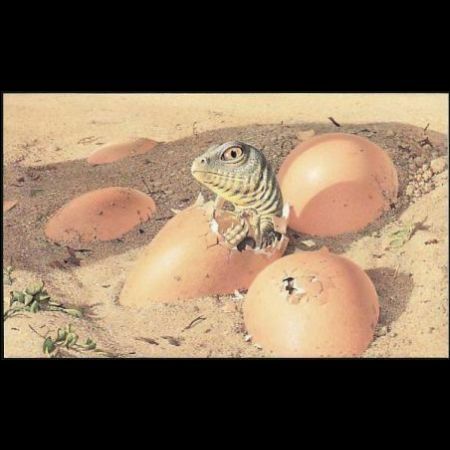 It probably fed on both plants and small animals, and relied on its great speed to escape predators. in Queensland. It may have relied on its speed rather than its bony armour for protection from predators. 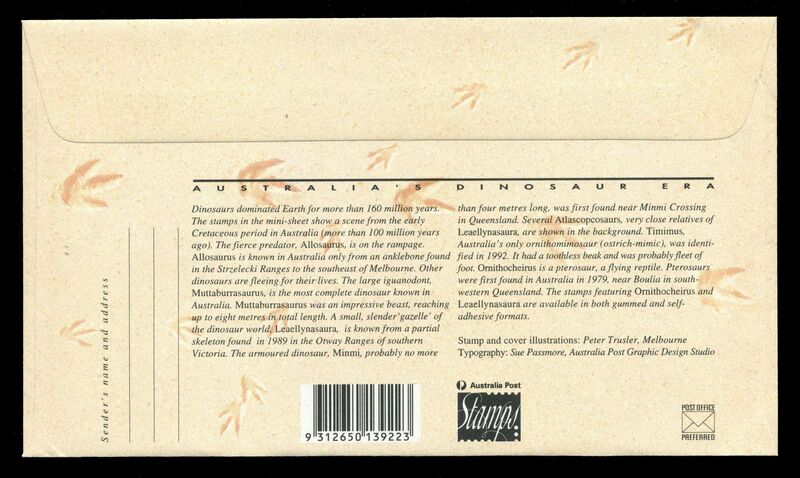 All but the tail of this dinosaur has been found, near Muttaburra in Queensland. Many of its bones were originally collected by local people, but after palaeontologists had excavated the remainder of the skeleton, a public appeal was made for the return of bones and the skeleton was reconstructed. 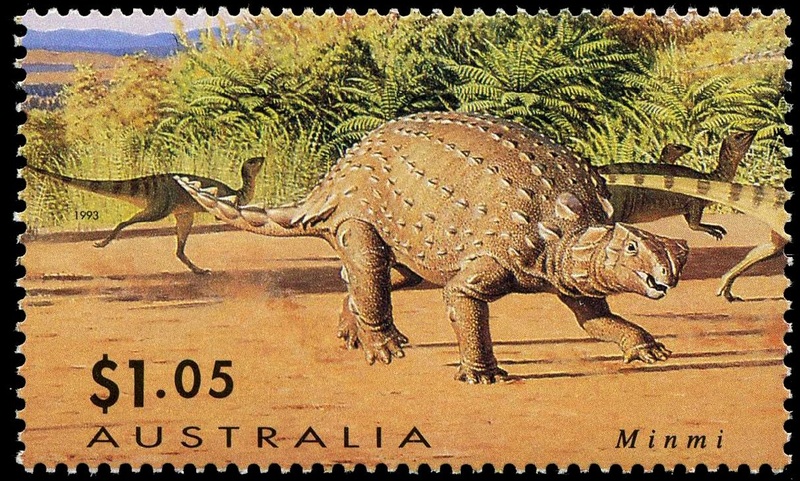 Muttaburrasaurus lived during the Early Cretaceous, 110 million years ago. It was similar in general shape to lguanadon and like its relative, a plant eater. About 8 metres long, it probably walked and ran on its hind legs, but was able to move on all fours when feeding. Its thumb claw was a flattened spike which may have been used for defence. The broad head ended in a horny beak which was used to tear leaves, twigs and fruit from trees; further back in the jaws were shearing teeth to slice up the food. 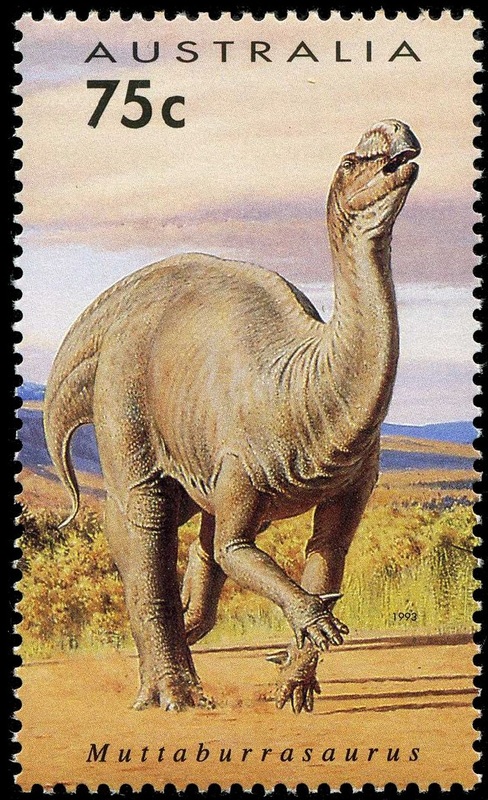 The top of the snout was expanded into a strange, hollow dome, similar to those seen in some duck-billed dinosaurs. 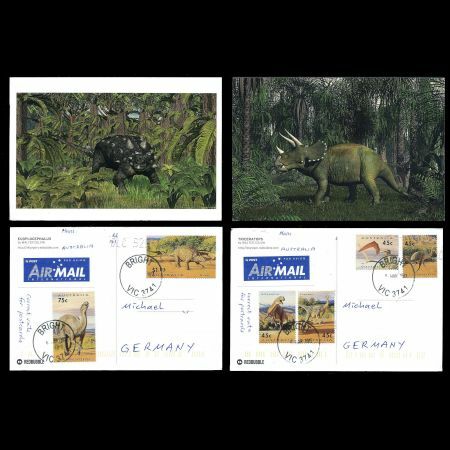 Connected to the nasal passages, these are generally considered to have been resonating chambers, allowing the dinosaurs to produce loud noises either as part of their mating ritual or to scare predators. 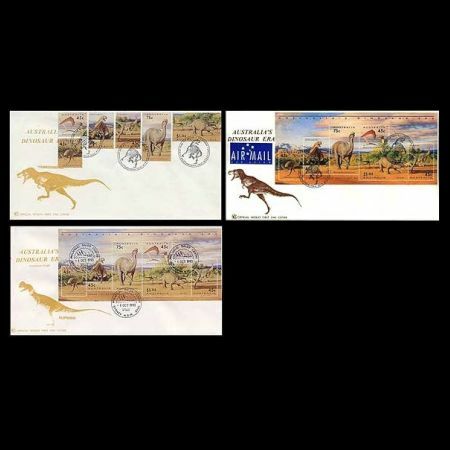 Muttaburrasaurus probably lived in herds.